Hamburger with Menu Sign Large 6.5' Tall! 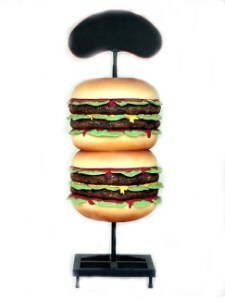 Large Hamburger Prop Display is Handcrafted from Resin, Metal and Wood. Display Measures Approx. 35"l x 35"w x 80"h and Weighs Approx. 74 Lbs. Hamburger Display has Menu Board to Advertise Your Daily Specials! Great Decor for Your Restaurant. Large Double Decker Burgers are on Metal Wheel Base for easy moving about. Butlers and Signs offers free standard shipping to the lower US,although other arrangements can be made. Buy now! Large Commercial Faux Food Displays - Ideal Decor for Events, and Fast Food Restaurants. Large Resin Food Displays!